Well, the first Monday of October has finally arrived and changes are already afoot. The US Supreme Court returned from its summer recess and welcomed a new Chief Justice to the helm. With the nation’s air waves abuzz this morning over President Bush’s nomination of Harriet Miers, it seems that the Washington’s attention has been focused on the Supreme Court as of late. Our focus has been on the US Supreme Court as well, but for entirely different reasons. Today, Justia, Oyez and US Court Forms are proud to release the first beta version of our new US Supreme Court Center. 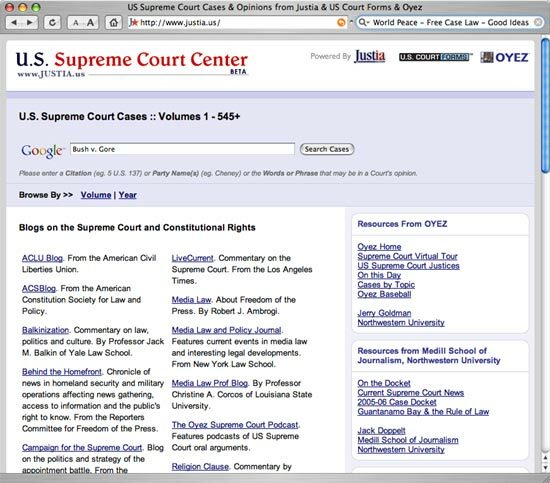 Many features are still under development, but the center does include all US Supreme Court decisions since volume one (1). This site is meant to complement the multimedia materials developed by Northwestern Professor Jerry Goldman’s Oyez project. We have also provided links to Supreme Court current awareness information from On the Docket by Northwestern Journalism Professor Jack Doppelt, as well as selected Supreme Court and Constitutional Rights Blogs on the Web. Thanks to Oyez and US Court Forms.